Pembroke Lodge020 8940 8207work Historic House A magnificent Georgian Mansion, set in some 2500 acres of Richmond Park with spectacular views across the Thames valley to Windsor and Surrey. The grounds are beautifully landscaped and include King Henry VIII mound. Previous occupiers include the Countess of Pembroke ~ "A close friend" of King George III, a Prime Minister and the philosopher, Bertrand Russell. Richmond Park provides 2500 acres of classic English Parkland. The Lodge is in one of the finest locations, on high ground with spectacular views to the West. The Lodge has eleven acres of beautifully landscaped grounds with many wonderful photographic locations. A magnificent Georgian Mansion, set in some 2500 acres of Richmond Park with spectacular views across the Thames valley to Windsor and Surrey. From the West - Head up the M3/A316, come off at Richmond, follow signs through the town to the Park (up Richmond Hill or Queens Road) and enter through the Richmond Gate. Turn right at the mini roundabout and the car park is on the right. From the North - Head down the A205 South Circular Road to Richmond, then as west. The closest British rail station is Richmond. Trains to Richmond are available from all mainland stations in the south-east:- Waterloo, Victoria and East Croydon, all of which transit Clapham Junction. 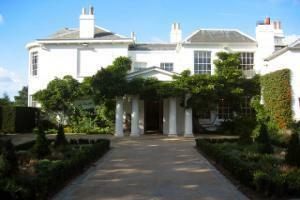 Pembroke Lodge is a short taxi ride away from Richmond Station. A taxi rank is located directly outside the station. The closest bus stop is ouside the American University - 371 bus from Richmond Town Centre or Kingston. The Lodge is then about a 20 minute walk away through the Park.